People climbing up walls and jumping off buildings in films such as Brick Mansions, Assassin's Creed, and Casino Royal aren't tricks of cinema. 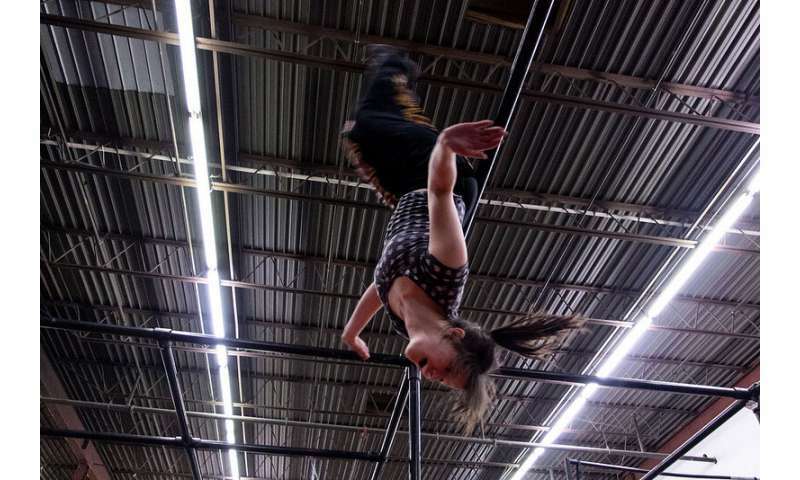 The athletes that perform these stunts are part of a global community that practise parkour – a gymnastics-like activity that developed from military obstacle courses. The objective of parkour is to move rapidly and effectively through a complex physical environment. Our research shows that science can help you practise better parkour – through running up walls more efficiently, and expanding your landing options. Even if you don't plan to take up the sport, it's an incredible thing to watch. Although parkour has been recognised as an official sport in some countries, it's impossible to determine how many people are involved worldwide. It's an activity that is generally unorganised, which may be part of its sub-culture appeal. To a casual observer, parkour athletes may appear reckless – but most train very hard, practising a broad set of individual skills that they use as they run through the environment. Men and women in the sport are referred to as "traceurs" and "traceuses" respectively. Some of the individual movements in parkour parallel those of other sports, such as gymnastics, athletics, and trail running. But much less research has been done on parkour than on more mainstream sports. This is unfortunate because they shared fundamental principles of generating and redirecting momentum. A better understanding of these can benefit all of these activities. One impressive feat that catches the eye of many parkour observers is the way traceurs run up high walls to get onto buildings. To climb high structures, parkour athletes run toward the wall and then kick off it with one (or more) contacts. This technique allows them to reach much higher than using a standing vertical jump, and also allows them to keep moving efficiently through the urban environment. To investigate how athletes accomplish this wall run efficiently we embedded a force plate in the ground and a second force plate in the wall. We then filmed study participants as they approached the wall. We watched how the athletes redirected their body by using a consistent transition strategy that depended on specific actions of the legs on the floor and wall. Although some parkour guides recommend athletes straddle the floor and wall simultaneously, we did not observe this – the traceurs always left the floor before they contacted the wall. We wanted to better understand the most efficient foot placement on the ground and the wall, and the effect of different approach speeds. So we built a computer simulation that could optimise each. The model corresponded well with what we observed – an intermediate run-up speed is best – and allowed us to understand why. During the run up you create horizontal momentum (the product of speed and body weight). Some of this horizontal momentum can be redirected into vertical momentum at take-off by keeping the leg on the ground rigid – a bit like a pole vault with a rigid pole. If the approach run is slow there is less horizontal momentum to transfer to vertical momentum. Then the take-off leg has to create vertical momentum by using the leg muscles – which is less efficient. With a very fast run-up, the take-off leg must act as a shock absorber, which wastes energy and wipes out the benefits of a faster approach. So, traceurs naturally select an intermediate run-up speed, allowing them to use the least amount of energy to scale the wall. To scale higher walls a faster approach may be required, but this also requires an ability to generate sufficient leg force. Greater speed does provide greater momentum but it also reduces the time available for the leg to generate the impulse (the product of force and time) necessary to scale the wall. Our research on jumping off walls shows that the type of landing that traceurs choose is influenced by their height, body mass, and leg power. Landing safely involves managing a number of different forces. Imagine you step or jump off an object – your body accelerates due to gravity. Upon landing, your body has a certain momentum that is determined by your weight and your speed. And the higher the object you jump off, the faster your landing speed and vertical momentum prior to landing. The main task in landing is to dissipate your momentum in a way in which the load and speed (making up the accumulated energy level) do not exceed biological limits (leading to a muscle tear or tendon rupture). The impact of momentum on the landing can be reduced by increasing the time over which landing forces apply. For instance, allowing the supporting joints to flex (that is, bend) over a greater range can gradually decrease momentum. Alternatively, it is possible to redirect the force by converting momentum into rotational momentum with a roll. This means that force becomes oriented in a direction that does least harm. The strategies that are available to an individual vary based on their body characteristics (such as height, weight, bone, joint and muscle strength, flexibility, and coordination). If the chosen strategy is insufficient to manage the momentum, injury to muscles or bones will result. Unsurprisingly, through our research we found individuals were more likely to roll when landing from higher drops. Our study subjects (nine men and two women) ranged in height from 1.58-1.87 metres, and in weight from 54–92 kg. At some heights a two-footed landing is not feasible. But in this study the maximum drop height was only 2.4 m and some traceurs chose not to roll even at this height. People with long legs can apply a smaller force over a longer time as they gradually flex their legs to absorb the momentum, and we found evidence that shorter traceurs rolled at lower heights. People who weigh a lot have more momentum when dropping from the same height as lighter people. We found this influenced the likelihood of rolling – heavier athletes were more likely to choose a roll landing when dropping from a lower height. Athletes with greater leg power appeared capable of managing impulse absorption through their legs up to a greater drop height. And those with less explosive leg power were more likely to transition to a roll landing at a lower height. While you can't do much about your height, you can change your body mass and leg power through training. In practice, this gives more flexibility because you can select a landing strategy based on the situation rather than having to roll to dissipate momentum.